As Brian Krzanich takes over from Paul Otellini as chief executive officer of Intel, there's one thing clear on his mind: Intel's lack of clout in the mobile space is a real problem. 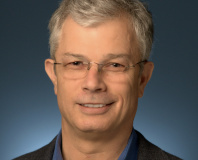 Named as the new CEO earlier this month, just two weeks before 40-year Intel veteran Paul Otellini left the company for good, Krzanich has had little exposure to the mobile space. 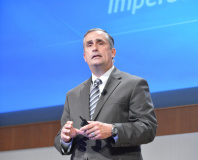 Having worked at Intel since 1982, Krzanich's experience comes from technical and leadership roles at the company's various fabrication facilities. He's clearly aware of which way the wind is blowing, however, and marks Intel's reluctance to get involved in the mobile market early on as a serious blow for the company he now leads. 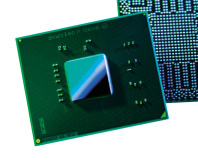 While Intel is now targeting the mobile market with system-on-chip variants of its Atom processors, it had long ignored the sector for what it saw as far more lucrative opportunities in desktop, laptop and server products. Indeed, the company all but gave away its small amount of expertise in that area back in 2006 when it sold its ARM-based XScale processor intellectual property - at the time a popular choice for personal digital assistants (PDAs,) the precursors to the modern smartphone - to Marvell without the launch of a replacement product line. While it's clear that Intel didn't want to line a rival's pocket or dilute the x86 instruction set architecture on which it relies for the overwhelming majority of its profits by retaining an ARM licence - having acquired the licence back in 1997 as part of a legal settlement with the Digital Equipment Corporation that saw Intel given the rights to DEC's StrongARM chips that would later become Intel's XScale - the decision to completely abandon the market years before its x86 chips would have reached the level where they can compete in the mobile space has to stand out as a remarkably naive move on the company's part. It's a mistake Intel is looking to correct, launching increasingly-powerful Atom processors for smartphone and tablet customers that offer price-performance parity with the best of the ARM licensees. In mobile, however, Intel is facing an uphill battle where industry momentum is not on its side: the majority of mobile development is done for ARM first and then ported to x86 later, if at all. That's a fact anyone with an Atom-based phone, such as the Motorola Razr i, can confirm: browsing the Android Market results in numerous applications that simply won't install on an x86 device, although the most popular apps have long since been ported with help from Intel's software division. Krzanich's comments, coupled with the appointment of software specialist Renée James as Intel's new president, suggest a new era is dawning for the company. Whether it can make up for lost time in a notoriously fast-paced market, however, remains to be seen. OnCue not proving popular with partners.